It’s hard to believe, but the final Salem Winter Market of the season is already here – Thursday, Dec. 18 from 3 pm to 7 pm on Artists’ Row. It’s your last chance to stock up on your favorite vendors until June, or take care of the rest of your holiday gift shopping. Here’s our recommendations for the “can’t miss” items at the final market. Valicenti Organico – from luxurious duck confit ravioli to gluten-free spaghetti, Valicenti’s fresh pasta freezes beautifully and cooks in minutes. Mandy’s Wicked Chowdah – vacuum-sealed in individual bags, Mandy’s chowder is perfect for freezing and insanely easy to prepare; instant comfort food for two in no time. Grant Family Farm and Long Hill Orchard – incorporate fresh produce into your favorite freezable dishes, like squash mac n’ cheese or sweet potato sausage soup. Stillman’s at the Turkey Farm – stock up on sausages and your favorite cut of meat for farm-raised meat all winter long. Long Hill Orchard – grab a wreath or garland for the front door or brighten up the porch. Wolf Meadow Farm – the holidays mean parties and guests, and that means you need hors d’oeuvres. Get a few good cheeses and your prep work just got easier. SalemSpice – make that special roast/side/dessert even more special with salts and spices for any dish. Witch City Wicks – move over, Yankee Candle. From Clean Cotton to Blue Spruce to…Opium, Witch City Wicks’ scented candles will get your house smelling just the way you’d like before your houseguests come to stay. Salem Soapworks – a local favorite, Kathleen’s beautiful soaps, lotions, and gift sets smell even better than they look. All Fruit, Inc. – Anne’s amazing combos of dried fruits and nuts are straight up addictive, and the range of options will allow you to please any palate on your list. Shine Jewelry – amazing beads and baubles for the jewelry lover in your life. Green Phoenix Threads – these one-of-a-kind jackets, scarves, and gloves will have everyone asking where they came from, and how they can get their own. And while you’re at it, don’t forget to swing by Jodi Bee Bakes for a special dessert or a little hot chocolate. See you at the Market! The History Lover – The House of Seven Gables Museum Store – 115 Derby St. The Gables store will be staying open late for the stroll, and will be serving cookies and wassail in the lobby. Visit one of Salem’s finest galleries and enter a free drawing for a beautiful framed photo of Salem Common at Christmastime. The Steampunk or Downton Abbey Lover – The Marble Faun Books and Gifts – 131-1 Essex St.
One of our favorite unique Salem boutiques carries all manner of Victorian, Brit-loving, literary fun – and tea! Remember Salem and Wynott’s Wands will have their wonderful Crown and Shield Hall open and decorated, with a special visit from Dumbledore himself. 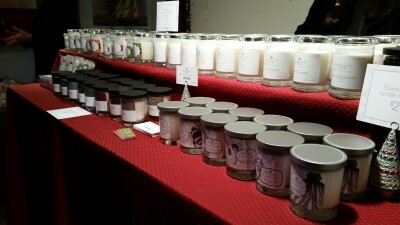 The Craft Fiend – Crafters Market Candles & Gifts – 82 Wharf St. While the Crafters Market carries much more than crafts, you’ll find plenty here for the crafty folks on your list. The Wine-Loving Craft Fiend – Boston Bead Company – 10 Front St.
Not only can you find any type of bead you could imagine here, Boston Bead will be offering a special Make-Your-Own wine stopper project. The Wiccan or Mystic – Angel’s Landing – 192 Essex St., The Coven’s Cottage – 190 Essex St., Pyramid Books – 214 Derby St.
Admit it, most locals have never visited the Wiccan or New Age stores that attract so many of our visitors. Spend just a few seconds in any of these three very different stores, and you’ll wonder what took you so long. The Interior Designer – Delande Lighting – 22 New Derby St., Edward John Home Décor – 100 Wharf St., Hedrington’s – 61 Wharf St.
From little pops of flair to big-ticket items, these stores have plenty to help homes sparkle and shine. The Friend with a New Baby – The Happy Sunflower – 78 Wharf St. The Happy Sunflower’s section of baby items is possibly one of the best-kept retail secrets in Salem. Plus, Santa’s visit to the Winter Walk on the Wharf starts at this store at 1 pm! The Fashionista – J. Mode – 17 Front St., Modern Millie Vintage & Consignments – 3 Central St., Ocean Chic Boutique – 96 Wharf St., Re-Find – 72 Washington St.
From funky to fashion-forward to functional, our amazing women’s retailers have options for any style on your list. The Male Fashionista – Re-Find Men’s – 244 Essex St.
Trust us, it’s a thing. Also, you’ve never seen so many dashing hats in your life. The “Under 12” Set – Mud Puddle Toys – 221 Essex St.
Our local toy store is pure happiness. Enough said. The Fisherperson – Joe’s Fresh Fish Prints and Tomo’s Tackle – 104 Wharf St.
From specific equipment to fish-print art, you can find anything and everything the fisher on your list could want. More varieties of salt than you could possibly imagine, plus free mulling spices with every purchase of $25. The Collector – Glass and Etc. – Museum Place Mall , Witch City Thrift & Consignment Shop – 301 Essex St.
Find the un-findable at either of these two unique stores. The Cyclist – The Urbane Cyclist – 144 Washington St.
As the Urbane Cyclist changes starts focusing more on custom bikes, their remaining stock is all available for an astounding 50% off. The Knitter – Seed Stitch Fine Yarn – 21 Front St. The Book Worm – Wicked Good Books – 215 Essex St.
Salem’s new bookstore is the place to be for any literary lover, and will always place special orders for anything they don’t have. The Choco-holic – Ye Olde Pepper Companie – 122 Derby St.
America’s oldest candy shop is still pushing the boundaries with new, delicious goodies, plus you might catch a candy-making demonstration throughout the day. Your Four-Legged Friend – Day of the Dog – 63B Wharf St., New England Dog Biscuit Company – 7 Central St., Penelope’s Pet Boutique – 99 Washington St.
It’s no secret that Salem-ites love our pets. Don’t forget your favorite fuzzy friend while shopping! The Family – Salem’s Vintage Photography – 172 Essex St.
Didn’t get a holiday card picture yet? Salem’s Vintage Photography will offer 15% off certificates and any customers on Saturday. Everyone Else – Roost & Company – 40 Front St.
Not sure who you’re looking to buy for, or what they might like? Roost always seems to have that thing you didn’t know you needed, plus you can keep any receipts from December to treat yourself to discounts in January. Yourself – Melita Fiore – 83 Washington St. Speaking of treating yourself, local patisserie Melita Fiore will be open late with hot chocolate and nibbles to reward dedicated shoppers. 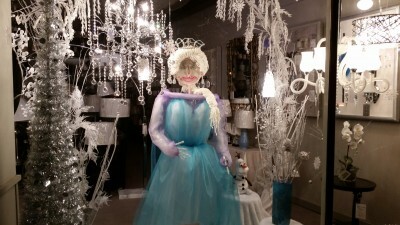 And don’t forget to vote for the Holiday Window Contest while you’re out there! Salem Winter Market Returns to Artists’ Row! The Salem Winter Market is back and better than ever! The Winter Market will run Thursdays from 3 pm to 7 pm, Nov. 13th through Dec. 18th (no market on Thanksgiving). Brought to you by Salem Main Streets, the City of Salem, and the same amazing team of volunteers who brought you the Salem Farmers’ Market, the Winter Market returns to its old home this year down on Artists’ Row, in between Front Street and New Derby Street. The buildings along the Row will be chock full of all kinds of produce, spices, pasta, baked goods, jewelry, soaps, and much, much more – just in time for the holidays! This year’s Winter Market will see the return of many of your old favorites (including Grant Family Farm, Long Hill Orchard, Salem Spice, Salem Soapworks, Mandy’s Wicked Chowdah, Shine Jewelry, Valicenti Organico, and Wolf Meadow Farm), some of your more recent favorites (Stillman’s, Jodi Bee Bakes, Auntie Elsie’s, and Far From the Tree Hard Cider), and some brand new friends (including SeaSalt Design, Sugar Coated Heaven, All Fruit Inc., New England Dog Biscuit Company, Green Phoenix Threads, and Witch City Wicks). One important thing to note this year is that not all vendors will be there all weeks, so each week will have a different array of goods to offer. We’re starting a little smaller the first week with only two buildings, but each week will grow and expand a little more. See the full list of vendors and dates here. Be sure to join us every week for the all the local quality, variety, and whimsy that you’ve come to expect from the Salem Farmers’ Market! 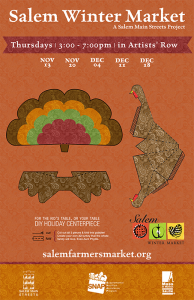 (Seriously, did you notice that you can make your own turkey centerpiece using the poster?!). Sadly, after weeks and weeks of beautiful weather, our Salem Farmers’ Market has ended its season a little earlier than planned due to a good old-fashioned New England nor’easter. Due to the anticipated rain and wind, we have pre-emptively canceled the final market on Oct. 23 for the safety of our vendors and customers. But what a tremendous season it’s been! We’ve helped over 30 small, local businesses connect face-to-face with their customers on a weekly basis. We welcomed an average of more than 2,100 visitors every week for 18 weeks. Word of mouth is that sales were generally up from last year, and many weeks saw vendors completely sold out of their most popular items. Over 20 local nonprofits were able to share their message with the community – from the Plummer Home to the Phillips House Museum to No Place for Hate. And hopefully, you all tried something new – a new vegetable, a new recipe, or maybe even a whole new way of shopping. We have a lot of people to thank for the success of this season. Without our amazing vendors and their wonderful products, there would be no market. Without the countless volunteers (especially our rockstar Farmers’ Market committee) who lug tables, manage our social media, or greet our customers, there would be no market. Without our sponsors, including Salem Five Bank, Solarize Salem, Next Step Living, and Salem Chiropractic, and all our partners, like the City of Salem, Mass in Motion, Salem Food Tours, and the Salem Chamber of Commerce, there would be no market. And of course, without all of YOU there would be no market! Before we call this season “over”, please tell us a little more about you and what you’d like to see at the market. But don’t despair – the Salem Main Streets will be bringing Salem Winter Market will be back again this year! Starting on November 13 and ending December 18, we will be down on Artists’ Row every Thursday except Thanksgiving from 3 pm to 7 pm. We’ll have some exciting new vendors, especially a few new craft vendors, but we’ll also welcome back a number of your Farmers’ Market favorites – including, but not limited to, Grant Family Farm, Jodi Bee Bakes, Salem Spice, Salem Soapworks, Shine Jewelry/Heritage Handmade, Far From the Tree Cider, and Valicenti Organico. The final list of vendors will be posted within the week on www.salemfarmersmarket.org. 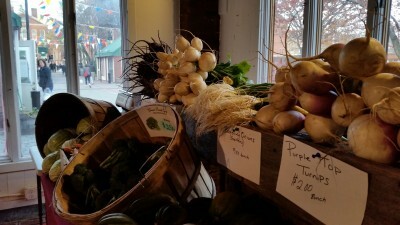 “Playing With Your Food” is a weekly post highlighting a few of the many great uses for the wide range of produce and artisan food at the Salem Farmers’ Market, a Salem Main Streets project. 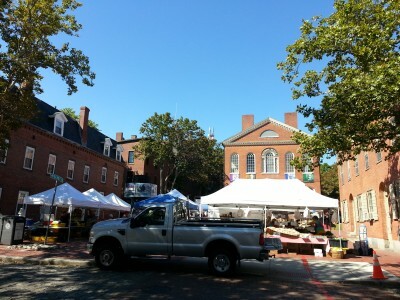 The Salem Farmers’ Market takes place every Thursday from June 12 to October 23 from 3 pm to 7 pm on Derby Square. While we can never predict exactly what our farms will be able to bring each week, we do our best to reflect some of the fun items we’ve found recently and what’s likely to be available for the upcoming week. Hopefully this will give you a few new ideas to play with, and inspire you to try some new things at the market. The fall weather is upon us! For many people, that means baking, roasting, and other warm, aromatic tasks. 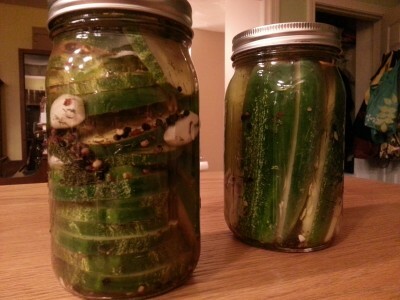 As for me, I pickle. Now, I understand that most people do their pickling and preserving in the summer, but much like the grasshopper in the fable, I am sometimes too happy enjoying my fresh produce during the summer to plan ahead for the winter. But with the first crisp in the air, I suddenly panic about all the wonderful produce I’ll be missing in January and start pickling everything in sight. 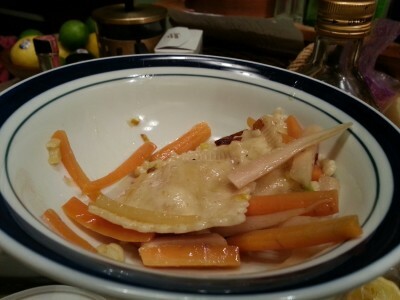 Pickled carrots with Valicenti Organico’s potato leek ravioli – one of those ideas that shouldn’t work, but absolutely does!